Our lab studies mechanisms of memory and memory disorders. We use a number of techniques and approaches that allow us to study memory from molecular mechanisms to the cells they affect, the circuits and neuroanatomy they modulate, all the way to behavioral studies in rodents and patients. For example, recently we have discovered the first mechanisms of memory allocation and memory linking and potential treatments for cognitive deficits associated with Neurofibromatosis type I, Tuberous Sclerosis, Noonan syndrome and HIV. Our field of study is Molecular and Cellular Cognition. Although mechanisms involved in encoding, storing and retrieving memory have attracted a great deal of attention, the processes that allocate individual memories to specific neurons within a network have remained elusive. Similarly, although the processes that connect and link information across time are critical for survival, they have also remained unexplored. Recent findings from our laboratory, using methods, such as optogenetics and a new generation of head mounted fluorescent microscopes, unraveled the first insights into the mechanisms that modulate memory allocation in neuronetworks, and showed that they are critical to link memories across time. We have shown that neurons compete to take part in memory traces and that the levels of the transcription factor CREB (cAMP-response element binding protein) determine the probability that a given neuron will be recruited into a given memory representation. Our electrophysiological studies showed that CREB-dependent transcription increases the excitability of neurons, and thus affects the probability that they will be recruited into a given memory. We first proposed that a key function of memory allocation mechanisms is to link memories across time! Recently, our laboratory showed that one memory triggers CREB activation and subsequent increases in excitability in a subset of neurons of a network, so that another memory, even many hours later, can be allocated to some of the same neurons. Recall of the first memory triggers the activation of those neurons and therefore the reactivation and recall of the other memory. These results represent the first molecular, cellular and circuit mechanism underlying the linking of memories across time! Han, J. H., S. A. Kushner, et al. (2007). "Neuronal competition and selection during memory formation." Science 316(5823): 457-460.(PDF). Won, J. and A. J. Silva (2008). "Molecular and cellular mechanisms of memory allocation in neuronetworks." Neurobiology of Learning and Memory 89(3): 285-292. Our laboratory developed a framework and as set of algorithms to create maps (simplified abstractions) of causal information in research findings that can be used to integrate information and guide research planning. Based on this framework and algorithms, we developed a free web application that helps biologists keep track and interact with causal information in research papers (www.researchmaps.org). Why researchmaps? In the last 20 years there has been a dramatic increase in the complexity of experiments and publications in Biology, including Neuroscience. This problem is specially severe in neuroscience, since in this field experiments often attempt to integrate across different sub-disciplines and levels of complexity, including, molecular, cellular, systems, behavioral, cognitive and clinical neuroscience. This discipline, for example, includes nearly two million research articles reporting approximately 20 million experiments. We are looking for neuroscience students to helps us with our researchmaps project! This is a great opportunity for students interested in learning how neuroscientists integrate and plan experiments! Contact us! The figure above shows a researchmap representing results in a published paper (Costa et al., 2002). Each node in the graph has three items that describe the “What” of the item (top; e.g., name), as well as the “Where” (middle; spacial/source information that distinguishes the item) and the “When” (bottom; temporal information that defines the item) information that defines it. 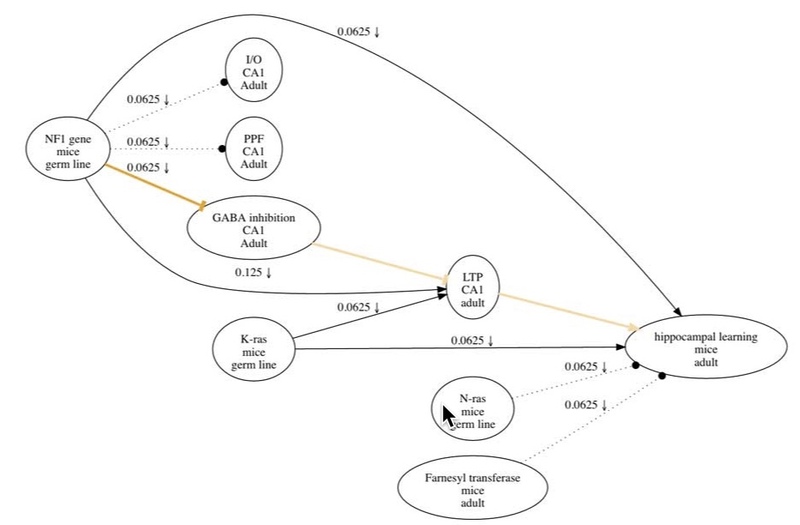 Nodes are connected by edges that characterize the nature of the causal relations represented, including excitatory (sharp edges), inhibitory (dull edge) and no relation (dotted line). Each edge also has a score that reflects the amount of evidence represented, and symbols that reflect the types of experiments carried out, including upward arrow for Positive Manipulations (that increase the probability of A and look at the impact on B), downward arrow for Negative Manipulations (that decrease the probability of A and look at the impact on B). Non-intervention (positive and negative) experiments simply track how A and B co-vary. Edges representing key hypothetical information mentioned in the paper do not have any weights or experiment symbols. Key edges for the main theses in the paper are highlighted in yellow in the map. This map was derived with a free web app that helps with the process of making research maps (www.researchmaps.org). We are developing a framework for classifying experiments in our field and a set of principles for integrating experimental results. The goal is to assemble objective maps of published information that would be useful for experiment planning.